Written by Richard Heinberg & David Fridley and first published at CounterCurrents. This is the introduction to Richard Heinberg's and David Fridley's new book, Our Renewable Future, now available from Island Press. Post Carbon Institute's companion website, ourrenewablefuture.org has also just been launched.The book is available to order and also to read on the website as a complete set of online chapters. The next few decades will see a profound and all-encompassing energy transformation throughout the world. Whereas society now derives the great majority of its energy from fossil fuels, by the end of the century we will depend primarily on renewable sources like solar, wind, biomass, and geothermal power. Two irresistible forces will drive this historic transition. The first is the necessity of avoiding catastrophic climate change. In December 2015, 196 nations unanimously agreed to limit global warming to no more than two degrees Celsius above preindustrial temperatures. While some of this reduction could technically be achieved by carbon capture and storage from coal power plants, carbon sequestration in soils and forests, and other “negative emissions” technologies and efforts, the great majority of it will require dramatic cuts in fossil fuel consumption. The second force driving a post-carbon energy shift is the ongoing depletion of the world’s oil, coal, and natural gas resources. Even if we do nothing to avoid climate change, our current energy regime remains unsustainable. Though Earth’s crust still holds enormous quantities of fossil fuels, economically useful portions of this resource base are much smaller, and the fossil fuel industry has typically targeted the highest-quality, easiest-to-access resources first. All fossil fuel producers face the problem of declining resource quality, but the problem is most apparent in the petroleum sector. During the decade from 2005 to 2015, the oil industry’s costs of production rose by over 10 percent per year because the world’s cheap, conventional oil reserves—the “low-hanging fruit”—are now dwindling (fig. I.1). While new extraction technologies make lower-quality resources accessible (like tar sands and tight oil from fracking), these technologies require higher levels of investment and usually entail heightened environmental risks. World coal and gas supplies have yet to reach the same higher-cost tipping point; however, several recent studies suggest that the end of affordable supplies of these fuels may be years—not decades—away. We will be consuming fossil fuels for many years to come, no doubt; but their decline is inevitable. We are headed to a nonfossil future whether we’re ready or not. Figure I.1. 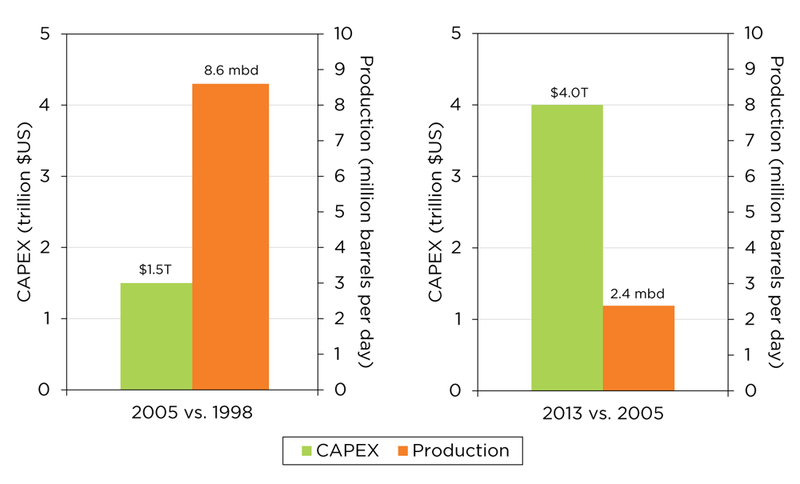 Change in world oil industry capital expenditures (CAPEX) and crude oil production, 2005 vs. 1998 and 2013 vs. 2005. Source: U.S. Energy Information Administration and Steven Kopits, “Oil and Economic Growth: A Supply Constrained View,” presentation at Center on Global Energy Policy, Columbia University, New York, NY, February 11, 2014. Nuclear fission power is not likely to play a larger role in our energy future than it does today, outside of China and a few other nations, if current trends continue. Indeed, high investment and (post-Fukushima) safety requirements, growing challenges of waste storage and disposal, and the risks of catastrophic accidents and weapons proliferation may together result in a significant overall shrinkage of the nuclear industry by the end of the century. Despite recent press reports about progress in hot fusion power and claims for “cold fusion,” these energy sources currently produce no commercial energy and—even if claims turn out to be justified—they are unlikely to do so on a significant scale for decades to come. Fossil fuels are on their way out one way or another, and nuclear energy is a dead end. That leaves renewable energy sources, such as solar, wind, hydro, geothermal, and biomass, to shoulder the burden of powering future society. While it is probably an oversimplification to say that people in the not-too-distant-future will inhabit a 100 percent renewably powered world, it is worth exploring what a complete, or nearly complete, shift in our energy systems would actually mean. Because energy is implicit not only in everything we do but also in the built environment around us (which requires energy for its construction, maintenance, and disposal/decommissioning), it is in effect the wellspring of our existence. As the world embarks on a transformative change in its energy sources, the eventual impacts may include a profound alteration of people’s personal and collective habits and expectations, as well as a transformation of the structures and infrastructure around us. Our lives, communities, and economies changed radically with the transition from wood and muscle power to fossil fuels, and so it is logical that a transition from fossil fuels to renewables—that is, a fundamental change in the quantity and quality of energy available to power human civilization—will also entail a major shift in how we live. How would a 100 percent renewable world look and feel? How might the great-grandchildren of today’s college students move through a typical day without using fossil fuels either directly or indirectly? Where will their food come from? How will they get from place to place? What will the buildings they inhabit look like, and how will those buildings function? Visions of the future are always wrong in detail, and often even in broad strokes; but sometimes they can be wrong in useful ways. Scenario exercises can help us evaluate and prepare for a variety of outcomes, even if we don’t know precisely which reality will emerge. Further, by imagining the future we often help create it: advertisers and industrialists long ago learned that creative product developers, marketers, and commercial artists can shape the choices, actions, and expectations of entire societies. If we are embarking upon what may turn out to be history’s most significant energy transition, we should spend some effort now to imagine an all-renewable world, even though the exercise will inevitably involve guesswork and oversimplification. A good way to begin visualizing the post-carbon future might be to explore how and why we came to construct our current “normal” reality of energy consumption. For most people living in the early nineteenth century, firewood was the dominant fuel and muscles were the primary source of power. The entire economy—including the design of towns and homes, and people’s daily routines—was structured to take advantage of the capabilities of wood and human or animal muscle. Food staples were often grown close to the point of consumption in order to minimize the need for slow and expensive horse- or sail-drawn transport. Many people worked as farmers or farm laborers, because many hands were required to do the fieldwork needed to produce sufficient food for the entire population. Traction animals were significant symbols of wealth: a prosperous farmer might own a team of oxen or mules, while his well-off cousin in the city might keep a horse or two to provide personal mobility. In slave-holding portions of the United States, some humans claimed ownership of other humans so as to make economic use of their intelligently directed muscles—a horrific practice that shattered the lives of millions (its effects continue to reverberate) and was ended only by an epic war. Meanwhile, vast tracts of forest in the northeastern United States were being cleared to provide fuel for home heating and, increasingly, for the operation of industrial machinery, including steamboats and steam locomotives. Then, in the mid-1800s, along came fossil fuels. Compared to firewood, coal and oil were more energy dense and therefore more portable, and they could be made available in greater quantities (especially since forests were disappearing due to overcutting). Compared to muscles, fuel-fed machines were formidable and tireless. Nineteenth-century inventors had already been devising ways to reduce labor through mechanization and to create new opportunities for mobility, communication, and amenity with devices ranging from the telegraph to the rail locomotive. The advent of cheap, abundant, and transportable fossil energy sources encouraged a flood of new or improved energy-consuming technologies. A series of significant inventions—including the electricity generator, alternating current, and the electric motor—made energy from coal (also from moving water and later from natural gas and nuclear fission) available in homes and offices. This opened the potential for electric lighting, washing machines, vacuum cleaners, and an ever-expanding array of entertainment and communications devices, including telephones, radios, televisions, and computers. Meanwhile, liquid fuels made from petroleum mobilized the economy as never before. Automobiles, airplanes, trucks, ships, and diesel-fueled trains began hauling people and freight at distances and speeds—and in quantities—that were previously unimaginable. Oil products also began fueling society’s raw materials extraction processes—mining, forestry, and fishing—resulting in far higher rates of production at much lower costs. By the mid-twentieth century, oil was increasingly transformed into plastics, chemicals, lubricants, and pharmaceuticals. And oil-powered machinery replaced human labor in agriculture, resulting in one of the most significant demographic shifts in history as the bulk of humanity left farms and moved to cities (fig. I.2). Figure I.2. 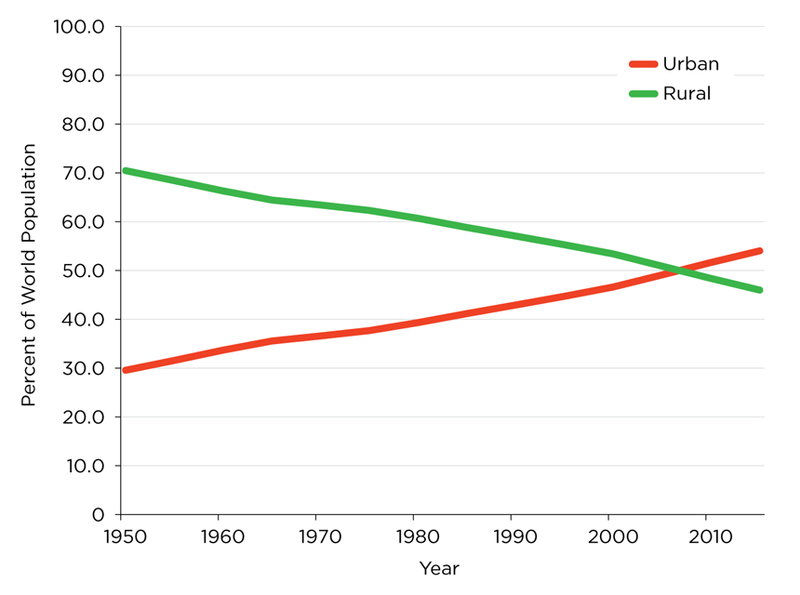 World rural and urban population, 1950–2015. Source:United Nations Department of Economic and Social Affairs, “World Urbanization Prospects 2014”. Because fossil fuels were so cheap relative to the power of muscles, machines took over much of the drudgery of life. Whereas human slavery had figured prominently in parts of the U.S. economy in the early nineteenth century, today each American commands the services of hundreds of “energy slaves” counted as the number of persons whose full-time labor would be required to substitute for the services currently provided by powered machinery. As energy is consumed in the making of roads, buildings, pipelines, food, clothing, and other products, it is effectively embedded or embodied in those objects. The built environment around us, and the manufactured goods with which we surround ourselves, represent immense amounts of fossil energy—energy used in the production of materials and goods through the operations of mining equipment, smelters, cement makers, trucks, road surfacers, and factories. During the same period in which fossil fuels began to power most aspects of daily life, we began to design our homes and cities to fit the machines and products that used those fuels or embodied the energy from their combustion. The automobile became the design centerpiece for suburbs, shopping malls, parking lots, garages, and highways. Meanwhile, expansion of transport by airplane required the construction of airports—the largest of which cover as much space as was formerly occupied by entire towns. All of this was undertaken with the tacit assumption that society would always have more fossil energy with which to maintain and operate its ever-expanding infrastructure. There was no long-range grand plan guiding the project. The fossil-fueling of the economy happened bit by bit, each new element building on the last, with opportunity leading to innovation. What was technically possible became economically necessary . . . and hence normal. It is easy now to take it all for granted. But we shouldn’t. As the energy sources that built the twentieth century ebb, it may be helpful to disabuse ourselves of many of our assumptions and expectations by observing how different “normal” is for North Americans as compared with people in rural villages in less industrialized countries, or by reading first-person narratives of daily life in the eighteenth and nineteenth centuries. As profoundly dissimilar as our current “normal” is to human experience prior to the industrial revolution, the future may be just as different again. Solar, wind, hydro, and geothermal generators produce electricity, and we already have an abundance of technologies that rely on electricity. So why should we need to change the ways we use energy? Presumably all that’s necessary is to unplug coal power plants, plug in solar panels and wind turbines, and continue living as we do currently. This is a misleading way of imagining the energy transition for six important reasons. Intermittency. As we will see in chapter 3, the on-demand way we use electricity now is unsuited to variable renewable supplies from solar and wind. Power engineers designed our current electricity production, distribution, and consumption systems around controllable inputs (hydro, coal, natural gas, and nuclear), but solar and wind are inherently uncontrollable: we cannot force the sun to shine or the wind to blow to suit our desires. It may be possible, to a limited degree, to make intermittent solar or wind energy act like fossil fuels by storing some of the electricity generated for later use, building extra capacity, or redesigning electricity grids. But this costs both money and energy. To avoid enormous overall system costs for capacity redundancy, energy storage, and multiple long-distance grid interconnections, it will be necessary to find more and more ways to shift electricity demand from times of convenience to times of abundant supply, and to significantly reduce overall demand. The liquid fuels problem. As we will see in chapter 4, electricity doesn’t supply all our current energy usage and is unlikely to do so in a renewable future. Our single largest source of energy is oil, which still fuels nearly all transportation as well as many industrial processes. While there are renewable replacements for some oil products (e.g., biofuels), these are in most cases not direct substitutes (few automobiles, trucks, ships, or airplanes can burn a pure biofuel without costly engine retrofitting) and have other substantial drawbacks and limitations. Only portions of our transport infrastructure lend themselves easily to electrification—another potential substitution strategy. Thus a renewable future is likely to be characterized by less mobility, and this has significant implications for the entire economy. Other uses of fossil fuels. Society currently uses the energy from fossil fuels for other essential purposes as well, including the production of high temperatures for making steel and other metals, cement, rubber, ceramics, glass, and other manufactured goods. Fossil fuels also serve as feedstocks for materials (e.g., plastics, chemicals, and pharmaceuticals). As we will see in chapter 5, all of these pose substitution or adaptation quandaries. Area density of energy collection activities. In the energy transition, we will move from sources with a small geographic footprint (e.g., a natural gas well) toward ones with much larger footprints (large wind and solar farms collecting diffuse or ambient sources of energy). As we do, there will be unavoidable costs, inefficiencies, and environmental impacts resulting from the increasing spatial extent of energy collection activities. While the environmental impacts of a wind farm are substantially less than those from drilling for, distributing, and burning natural gas, or from mining, transporting, and burning coal, capturing renewable energy at the scale required to offset all gas and coal energy would nevertheless entail environmental impacts that are far from trivial. Minimizing these costs will entail planning and adaptation. Location. Sunlight, wind, hydropower, and biomass are more readily available in some places than others. Long-distance transmission entails significant investment costs and energy losses. Moreover, transporting biomass energy resources (e.g., biofuels or wood) reduces the overall energy profitability of their use.This implies that, as the energy transition accelerates, energy production will shift from large, centralized processing and distribution centers (e.g., a 500,000 barrel per day refinery) to distributed and smaller-scale facilities (e.g., a local or regional biofuel factory within a defined collection zone or “shed”), since the same amount of “feedstock” cannot be concentrated in one place. It also implies that population centers may tend to reorganize themselves geographically around available energy sources. Energy quantity. As we will see in chapter 6, quantities of energy available will also change during the transition. Since the mid-nineteenth century, annual global energy consumption has grown exponentially to over 500 exajoules (fig. I.3). Even assuming a massive build-out of solar and wind capacity during the next 35 years, renewables will probably be unable to fully replace the quantity of energy currently provided by fossil fuels, let alone meet projected energy demand growth. This raises profound questions not only about how much energy will be available but also for widespread expectations and assumptions about global economic growth. Figure I.3. World primary energy consumption by fuel type, 1850–2014. Primary electricity converted by direct equivalent method. Source: Data compiled by J. David Hughes. 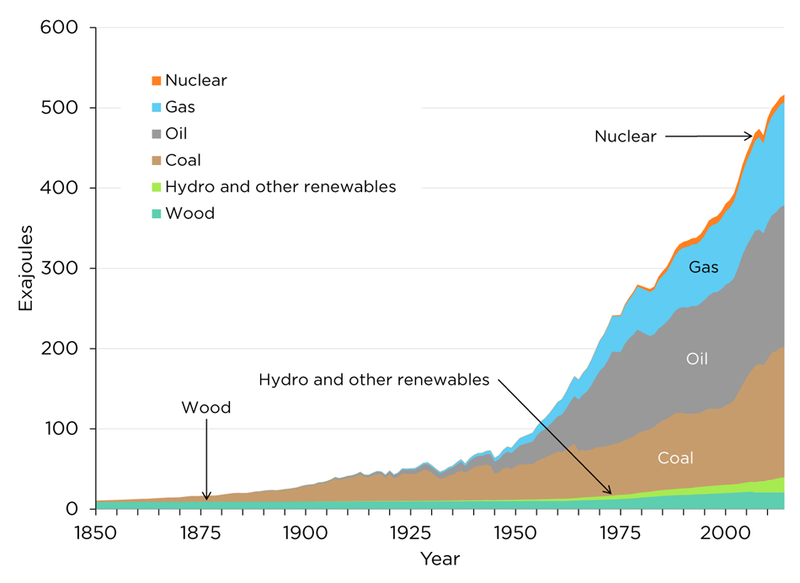 Post-1965 data from BP, Statistical Review of World Energy (annual). Pre-1965 data from Arnulf Grubler, “Technology and Global Change: Data Appendix,” (1998). For these six reasons, we should explore now how energy usage must and will evolve during the next few decades as the world transitions (willingly or not) to renewable energy. As we’ve already seen, our current patterns of energy use developed in response to the qualities and quantities of the energy available to us during the past century. Fossil fuels provided significant advantages: they were available on demand, cheap, portable, and energy dense. They also entailed costs, including climate change and other environmental and social impacts. Renewables offer their own suite of advantages, the most obvious of which are that, with solar and wind, there is no fuel cost, and they have far lower climate and health impacts. But that doesn’t mean these are truly free or limitless energy sources: the devices used to capture energy from sunlight and wind require materials and embodied energy. Further, the energy we get from these sources is variable and won’t substitute for all current fossil fuel uses. 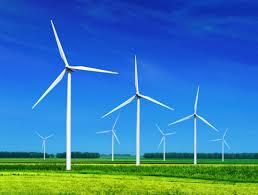 And the technologies we use to harvest energy from sunlight and wind have their own environmental impacts. Engineers will certainly make every effort to adapt new energy resources to familiar usage patterns (e.g., by replacing gasoline-fueled cars with electric cars). We can, to a certain limited extent, press solar and wind into the mold of our current energy system by buffering their variability with energy storage technology and grid enhancements. But the larger the proportion of our total energy we get from these resources, the more our buffering efforts will cost in both money and energy. Over the long run, usage patterns will almost certainly change substantially as we adapt to renewable energy resources. The problem with our current energy usage patterns is not simply that they are wasteful (though they often are) or that we use energy to do things that are harmful (though we often do). Even disregarding those legitimate concerns, many current energy usage patterns probably just won’t work in an all-renewable world. While the main thrust of this book is to examine how energy usage is likely to change in an all-renewable world, we will begin by reviewing the basics of energy and looking closely at how we currently power society. Then we will take a survey of energy supply and demand issues, exploring the changed circumstances to which society will be adapting. This portion of the book consists of five chapters—three discussing energy quality (one on electricity, one on liquid fuels, one on other energy uses), one exploring how much renewable energy capacity might be available by midcentury, and one answering various objections likely to be raised to our conclusions about future energy supply. The book concludes by discussing the critically important questions of how to ensure that everyone benefits from the renewable energy transition and what steps can and should be taken now to put us on a path toward a truly just and sustainable future. The goal of this book is to help readers think more clearly and intelligently about our renewable future. An all-renewable world will present opportunities as well as challenges. And building that world will entail more than just the construction of enormous numbers of solar panels and wind turbines. Along the way, we will learn that how we use energy is as important as how we get it. Indeed, unless we adapt our energy usage patterns with the same vigor as is devoted to changing energy sources, the transition could result in a substantial reduction of economic functionality for society as a whole. He is Senior Fellow of the Post Carbon Institute and is regarded as one of the world's foremost advocates for a shift away from our current reliance on fossil fuels. David Fridley: Since 1995, David Fridley has been a staff scientist at the Energy Analysis Program at the Lawrence Berkeley National Laboratory in California. He is also deputy group leader of Lawrence Berkeley’s China Energy Group, which collaborates with China on end-user energy efficiency, government energy management programs, and energy policy research. Mr. Fridley has nearly 30 years of experience working and living in China in the energy sector, and is a fluent Mandarin speaker. He spent 12 years working in the petroleum industry both as a consultant on downstream oil markets in the Asia-Pacific region and as business development manager for Caltex China. He has written and spoken extensively on the energy and ecological limits of biofuels. David is a Fellow of the Post Carbon Institute. It does seem to largely steer clear of the more radical issue, i.e. the capitalist system. However, it does mention that energy use will need to change, use less, which is incompatible with capitalism. Most of the countries are working hard to meet growing demand for electricity, with many targeted renewable fossil fuels.